Today we're introducing you to Francey Bunn, beekeeper, creative, and the owner of Tea and Wildflowers. Nicola: We’d love you to start by telling us about Tea and Wildflowers and your creative journey so far? Francey: Tea and Wildflowers is the name of my small business selling honey and beeswax products with potential to include handmade and old things in the future. I came up with the name to fit with the idea of plant based living and to conjure the magic of my everyday. Childhood memories of long sunny afternoons with tea and books in our South London garden have stayed with me. The garden was packed with fruit trees and we enjoyed its bounty throughout the year: open tarts and mousses in the summer and jams and jellies to take us through to the next harvest. One year our apricot tree broke under the weight of fruit and my mother made so much jam. I'd been wanting to keep bees for ages; it's a craft I feel I'm suited to because I love the summer and enjoy new knowledge and skill sharing. Beekeeping is about so much more than honey. Hanging out by the hives watching these beautiful insects take flight and return home laden with pollen on a golden afternoon is so joyful. I put back my plans when we adopted our first dog an unruly GSD who took a while to settle and then four years ago I joined the local beekeepers' association hived a swarm or two and now have six colonies. Each of my queen bees has a name from medieval literature; Guinevere, Aliénor and Isolde were the first three I kept in the apiary nearest home. Hopefully the colonies will expand again this year; I usually inspect the hives as soon as we get temperatures of about 10C, typically a nice sunny day in March. I'm nervous to see if the colonies have survived especially when we've had snow and freezing conditions. I try to inspect the frames without too much disruption and am praying for the biscuit coloured slab of brood that proves the queen bee is happily laying eggs. If all is well I'll just put the hive roof back on and make weekly inspections thereafter. Sometimes a small intervention is needed to keep the colony happy. I never rush things and often go back the following day after I've had a long think about what to do for the best. There's a lot of lifting of wooden boxes and as I have my hives in three different locations I drive round quite a bit and I have to be organised with my kit. I don't normally take frames of honey from the hives until July when I feel confident about surplus levels. 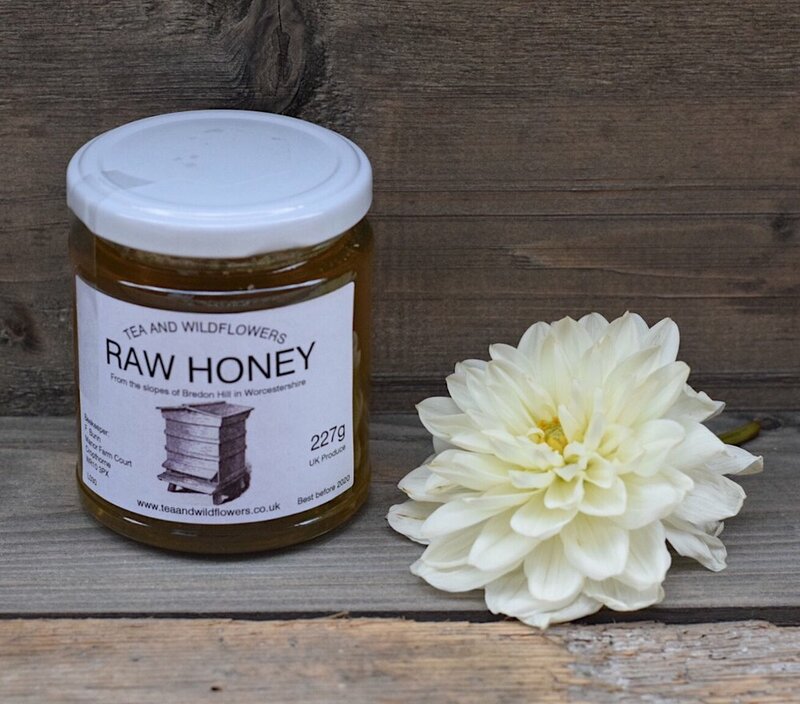 The honey I sell is raw, filtered once only and comes from a single hive; a truly artisan product. I talk to the bees quite a lot, telling them about what's going on in my life, encouraging them and thanking them for sharing and we toast the bees with honey cocktails at our family harvest supper in October to show our appreciation. Nicola: From where do you draw your inspiration? Francey: I draw inspiration first from the landscape around me: small farms, green pastures, hills, valleys and woodland are part of my DNA and I need this kind of setting to prosper. I'm inspired too by women and men who have gone before me, from my own family and others I know through their writing and creativity. As a child I loved to read about adventurers like Laura Ingalls, Amelia Earhart and Grey Owl. I didn't become an aviator but I do my own version of Little House on the Prairie and of all the road trips my husband and I have made, it's the great wildernesses of the Pacific Northwest that continue to nourish us. Perhaps most influential of all is my French heritage, stories from way back about growing vegetables, making cheese and drinking tisanes are my personal treasure trove. My creativity runs through a collection of projects, harvesting honey, candle making, dyeing cloth and using herbs for health and well being, and they all have plants as their starting point. Nicola: Can you tell us about the process of your work, from initial idea to the finished product? Francey: I could usefully tell you about my candle making here. As a beekeeper I have quite a bit of wax at the end of the season and as I love candles I thought I'd try making some. I started with hand dipping which is the most made by hand method but the results weren't pleasing so I started researching moulds. I found a pine cone mould I thought looked pretty realistic and then considered some of my vintage baking tins. The sweet floral aroma of the beeswax persuaded me to sell my candles online and locally and they've been a runaway success. I needed to source more beeswax which I was able to do locally as I know quite a few keepers so this make is sustainable; I have plans for pharmacy jar candles this year. Nicola: Can you tell us about where you live, what your workspace looks like and what a day in your life is like? Francey: We've lived in a small village just north of the Cotswold Edge for a long while now and I'm grateful for the warm Atlantic breeze that sweeps up the Severn and Avon valleys keeping us above freezing temperatures for most of the year. My garden isn't vast and I've planted it to echo the surrounding landscape, trees and hedges and grass at different levels. There is a woodland area under some mature birch trees which I look out to from my little studio or summer house as it's known. I'm very fond of the old brick wall which runs the length of the garden. It belonged to the farm buildings serving the Manor House across the road: a lovely antique next to our modern house. A few visitors have commented about the absence of flowers in my garden. I'm happy with shades of green and brown with a few white pelargoniums to dress the porch in the summer. I'm not a morning person so my day doesn't really start till after 9 but I often stay up late. You might have guessed that I'm a tea drinker and I have a different brew according to my mood. My favourites are verveine, mint and lemon balm, all from the same plant family. 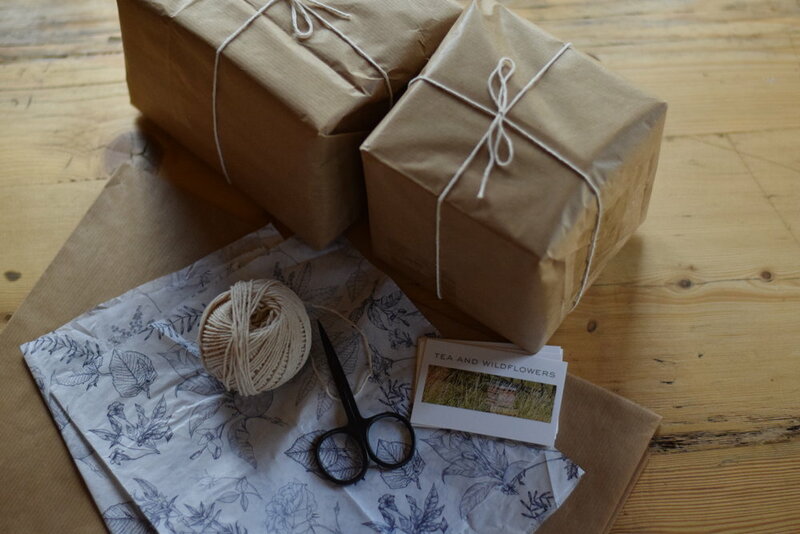 I try to have a window of creativity in the morning and one in the afternoon when I might pour some candles, visit my hives, go on foraging walks and style photos to use on my website or for Instagram. Fun admin tasks like planning, ordering supplies and catching up on IG tend to be an evening thing. If I have a longer piece to write I do that in my PJs as I eat my morning porridge. Nicola: When you aren’t creating what do you enjoy doing? Francey: I like to spend time with my children which these days often involves the internet. My son lives in Arizona and I love chatting to him on Sunday evenings, his Sunday morning. My daughters are quite a bit closer in London and Oxford and it's lovely to exchange visits and texts with them so regularly. They tell me they like to read about what I'm up to on Instagram and we swap ideas and recommendations all the time. Swimming is my first choice for exercise, the feeling of being in water is so restorative and mindful. I'm a regular at the Cheltenham Lido in spring and summer and in winter I use indoor pools. My favourite swims though are in the sea but I have to be on holiday for those as we live about as far away from the coast as is possible here in the UK. Nicola: We’d love to hear more about your love of photography and all things hand-made, and how you incorporate both of these into your daily life? Francey: I can't really separate photography from writing, both tell stories and I like to use them together. I guess Instagram has made me see it this way. I love photos that tell parts of stories which we then fill in. I have a new website coming online this summer. I want to extend my IG, make it bigger and deeper. Concept wise it's a kind of grimoire but more natural secrets than supernatural ones. My first posts are about foraging, teas and tisanes and a short story about a beekeeper. I write because I am but it can be hard sometimes when the words are heavy and I'm just not getting my ideas across. Light is everything for a good photo so I know the places in the house and garden and the times of day that are more promising. As with writing I keep trying things out, make small changes and try again. Handmade things make my heart sing and I buy from small producers like Winchcombe pottery or I browse Etsy, but to be honest I don't buy much, I just look after the things I already have and sometimes reinterpret them with paint or dye. I like a pared down aesthetic so clutter is not my friend. Nicola: And lastly, if anyone reading this would love to follow their own creative dream, what advice would you give them? Francey: To anyone who's just started out on their creative journey and I'm not very far down that road, I would recommend a few things; scheduling short and long term goals, so last year it was setting up my shop on Etsy, finding local stockists and getting some kind of brand identity going, and this year, I've got some help with my Instagram and with my new website. It's so important to invest in yourself too because early success will give you the feeling of achievement you need. Working with others is also great for development. I've recently started a shared project with Heather, a herbalist I met on the Creative Countryside Winter Gathering in January (check her out on IG @northstarnomad); we are exchanging letters about dyeing cloth and growing honey plants like buckwheat, phacelia and quinoa to provide pollen and nectar for bees. I've made a start with dyeing linen using walnut shells and avocado skins. Seed sowing so I'll have some strong plugs to plant around the hives is next up. It was Heather's suggestion too, that we share some reading and we've chosen Braiding Sweetgrass by Robin Wall Kimmerer to take us through the next few weeks. I feel I need to say more about reading and how books including fiction are so important in the creative journey. Whenever I have an idea, I develop it through reading and conversations with folk who have done something similar. Only then can I start to work independently and make something of my own.